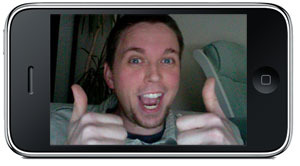 Video Chat Coming To The Next iPhone? All Signs Are Pointing To Yes! As they do with any major new iPhone OS release, people have been tearing apart the iPhone OS 4.0 SDK from the very second it was available. Almost immediately, someone noticed that bits and pieces of iChat had found their way into the new software. By itself, it didn’t really make sense. The iPhone has plenty of incredibly solid third-party IM applications — some of them being amongst the App Store’s best sellers. Why would Apple be sneaking any parts of iChat onto the iPhone? Then the first mentions of a front facing camera were unearthed, and it all started coming together in the form of two little words: video chat. Alas, there was no concrete proof that Apple was following the same train of thought.. until now. You see, much of iPhone OS’ underpinnings can be revealed through tricks called “class dumping” and “string dumping”. Through class dumping, you can take a peek into which frameworks and APIs are being used by any given application. (Ever heard of an application using “unpublished” APIs? This is how the developers found those APIs in the first place — and how Apple caught them, for that matter.) Through string dumping, all of the various bits of text pre-programmed into an app can be ripped out and displayed. When the guys over at 9to5Mac started using the above techniques to explore the innards of the new SDK, it all came spilling out. There they were, in good ol’ plain English: references to video chatting, ranging from inviting users to terminating calls. More digging unveiled that Apple appears to be testing video chat on four servers: three privately located on Apple’s own intranet, and one which is (currently) open to the world (albeit mostly useless). We spoke to our own sources, many of whom were tight-lipped on the matter. Of those who did pipe up, they were able to confirm 9to5’s findings, along with at least 30 other references to video chat support that went unmentioned. All of them — and us, for that matter — seem to be wondering the same thing: why the heck did Apple leave this in (semi-private) public view? Apple’s known for shrouding even the most minute details in secrecy; here, it’s seems as if they’re almost intentionally throwing many dozens of hints about an unannounced feature in a place where tinkerers were almost guaranteed to find it. Is Apple learning to love the rumor mill? My current educated guess based on everything that has been whispered to me so far: I don’t think iChat, as an IM client that would compete with the third party apps, is coming to the iPhone — but that Apple will be using bits and pieces of the iChat core to power their video chat service. I’ll keep my ear to the ground for more.